I came across this little piece and thought it might be useful for some youth groups with younger kids who would like to talk about caves in their programs. I think this would also be useful for teachers and homeschool providers as well. Bridal Cave is a commercial cave near Camdenton, MO. They have special tours that target the imagination and curiosity of elementary school-aged childeren. They also have a PDF file called "Discovery News", which can be used in a classroom setting, even if the teacher doesn't know anything about caves or caving and even if you are nowhere near Missouri. 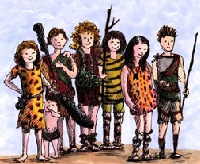 here: http://www.bridalcave.com/pdf/kids_only_adventure_news.pdf. If you find it useful, email the cave owns at info@bridalcave.com and let them know. Oh yeah, and let them know that YOUCave sent you.